Cucullia antipoda Strecker, 1877, Lepidoptera, Rhopaloceres and Heteroceres, 14:129. 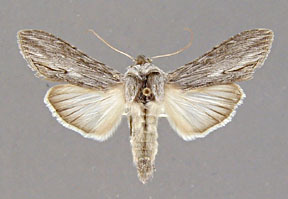 Cucullia propinqua Smith, 1894, Trans. Amer. Ent. Soc., 21:85. 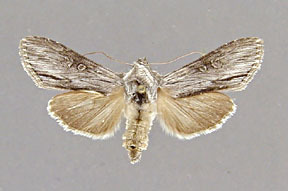 Copicullia [sic] luteodisca Smith, 1909, Jour. New York Ent. Soc., 17:63. Copicucullia antipoda race adopitna Barnes and Benjamin, 1927, Canad. Ent., 59:6. Diagnosis: Cucullia antipoda is a confusing species. The species exhibits both significant inter- and intrapopulation variability. 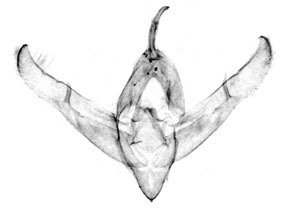 There is a bewildering polymorphism within populations involving coloration, wing shape, and the development of a ridge on the front of the head. Two basic morphs can be defined. 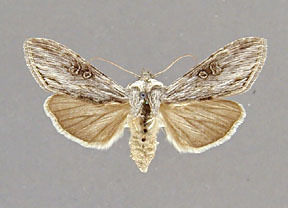 The forewing of one morph is uniform light, dull gray and the hindwing is usually suffused with light brown, the base not contrasting with the outer margin. This form also tends to be smaller and to have broader wings than the second morph. The second basic morph has a darker forewing with a slight blue tint and the middle of the median area is distinctly lighter than the rest of the wing. 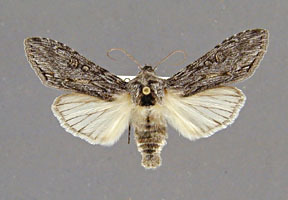 The base of the hindwing is often significantly lighter than the outer margin. 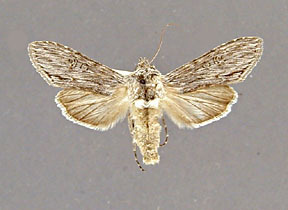 This second morph is, on average, larger and more narrow winged than the first morph. This division into two morphs, it should be emphasized, is anything but clear cut. 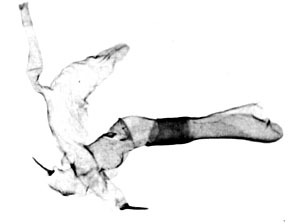 Although many specimens within a locality tend to fall neatly into one category or the other, other individuals exhibit characteristics of both. Wing length from base to apex: mean = 18.44 mm., standard deviation = 0.89 mm., n = 10. Distribution: This species is widespread in the desert regions of western North America, particularly in the Great Basin. Cucullia antipoda is known from southern British Columbia, eastern Washington, Oregon, throughout Utah, Nevada, central and western Colorado, northwest Wyoming, western North Dakota, northern and central Arizona, New Mexico (except in the east), and California (except along the central and northern western coast). Two populations of antipoda are more lightly colored than the typical population; a population at Olanche in east central California and an isolated population at Callao, Utah on the edge of the Great Salt Lake Desert. 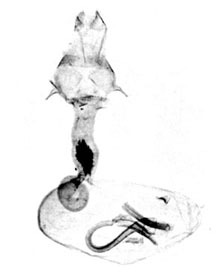 The name adopitna is available for the eastern central California population if a subspecies concept is employed. Both of these light populations are probably local adaptations to very arid conditions possibly with light or salty soil. 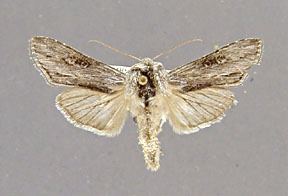 Other light populations, although not as distinctive as the two mentioned above, occur in southern California. Populations in New Mexico are slightly larger than normal with a greater predominance of the dark form. 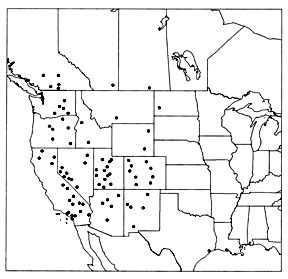 The adults fly from June to August in most of the range, but fly earlier in southern California where specimens have been taken as early as late April and are commonest in May and June. Foodplants: The early stages of this species are unknown, but the foodplant or foodplants is likely to be a shrubby composite.